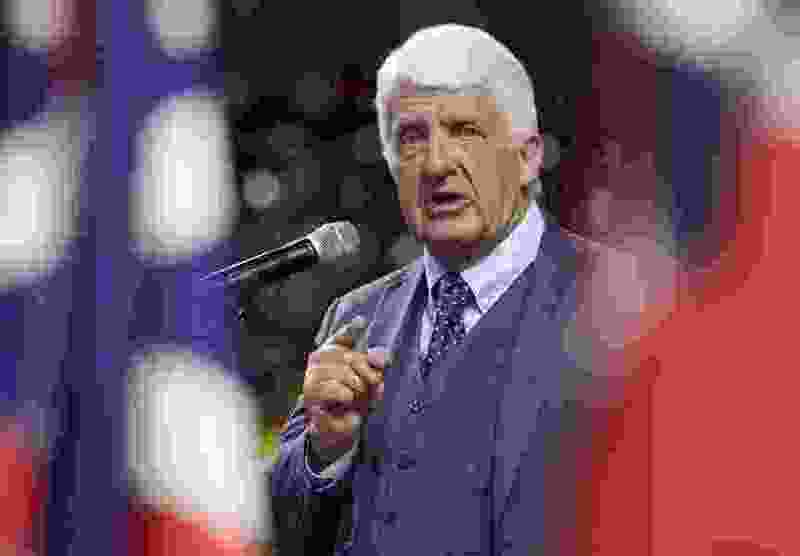 (Leah Hogsten | The Salt Lake Tribune) Rob Bishop, representative for Utah's 1st Congressional District, delivers his re-election speech at the Utah Republican Convention on Saturday, April 21, 2018, at the Maverik Center in West Valley City. Washington • Utah Reps. Rob Bishop, John Curtis and Chris Stewart handily rolled to re-election Tuesday, unsurprisingly holding the line against their Democratic opponents according to unofficial results. The congressmen didn’t face competitive races in their strong GOP districts where Democrats have failed to make headway since redistricting in 2010 — or even before when it comes to Bishop, who has slid to another term every two years since running the first time in 2002. This will be his final House campaign. “I am humbled going into my last term in Congress,” Bishop said. Several national news outlets projected Tuesday night that Democrats had claimed enough seats in the midterms to take control of the House, leaving at least three of Utah’s four members in the minority. Utah’s 4th District race, between Rep. Mia Love and Democratic challenger Ben McAdams, is expected to be close and may take a few days to sort out. Curtis, a freshman serving out the remainder of former Rep. Jason Chaffetz’s term, says he’s excited that voters “validated” his work over the past year to elect him to a full two-year term and that he will continue to work in a bipartisan manner even if in the minority. “No doubt good friends lost their races tonight and that’s unfortunate because I’ve really enjoyed the relationships I’ve been forming back there,” Curtis said, but added the bills he’s passed out of the House were either by voice vote or nearly unanimous. “I’ll continue that track of working on a bipartisan fashion and look forward to still being able to accomplish things that we can do when we work together,” Curtis said. While Utah isn’t President Donald Trump’s strongest territory, he may not have played a strong role in the Utah races even as a majority of voters across the country said Trump was one of the main reasons to turn out to the polls. Shireen Ghorbani, like many Democrats nationwide, tried to tie Stewart, her 2nd District opponent, to Trump, noting at one point he quipped that he loved the president. United Utah Party’s Eric Eliason charged during the 1st District campaign that Bishop, and the rest of the Utah GOP delegation, had refused to call out Trump for his rhetoric and actions. Curtis, in his 3rd District battle against Democrat James Singer, distanced himself somewhat from Trump, citing support for tax reform but not the president’s immigration plans. Ghorbani said the election was a win for her team, noting the big turnout for a midterm election and a voter base that’s energized. Stewart won the district by a 28 percentage point margin two years ago, and among early results held a 20-point lead on Tuesday. Bishop, Utah’s longest-serving House member, may be the most affected by a Democratic takeover. He’d lose his chairmanship of the House Natural Resources Committee and be relegated to the minority in the chamber where he’s been a powerful force on the House Rules Committee that decides how legislation is handled on the floor. Democrats would likely amp up the investigations focused at the president and with several chairmen allowed unilateral subpoena power, the White House would be inundated with requests. Utah’s House members also would find themselves in a position where legislation they’re pushing isn’t on a priority list of the new Democratic leaders. Cara McDonald contributed to this story.